Cooper Wiring Device 1-Pole Residential grade toggle switch has voltage rating of 120-Volt AC and current rating of 15-Amps. It withstands dielectric voltage rating of 1500-Volts. Switch in white color, has polycarbonate housing and thermoplastic/PVC toggle. It features additional push-in common termination for feed-through tapping. 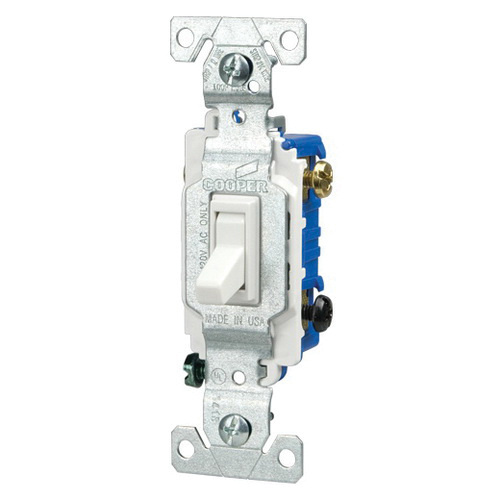 With side and push wiring, this switch accommodates wire of size 14 - 10-AWG. It features push-in common termination for feed-through tapping. Switch has long, broad mounting strap that virtually eliminates floating installations. It has maximum load capacity of 1/2 hp 120-Volt AC. Switch comes with tri-combo screws that accept slotted, Phillips, and Robertson-head tools for installation flexibility. It measures 1.3-Inch x 1.1-Inch x 4.19-Inch. Switch operates at temperature range of -20 to 60 deg C. It is UL 94 V2 flammability rated to withstand harsh environmental conditions. Toggle switch is cULus/UL listed, NOM certified and RoHS compliant.